The talks will be given by Emmelie Koster, curator of No Man’s Art Gallery, art consultant and independent art market researcher. She will share her experiences with a fresh generation of Chinese art collectors. The talks will be given in English with Chinese live-translation. NMAG recently announced that it will focus increasingly on connecting Chinese collectors with international emerging artists, and international collectors with Chinese emerging artists. Shanghai will see the second No Man’s Art Pop-up Gallery open in the fall of 2016, and a number of art talks are on the calendar throughout China. The talks will offer you inspirational stories about collecting art early in the artist’s career and valuable insights about creating a diversified collection while keeping to a budget. The first talk takes place November 13, 2015 in Shanghai. International law firm Jones Day will be hosting the event in their office on the Shanghai Bund. 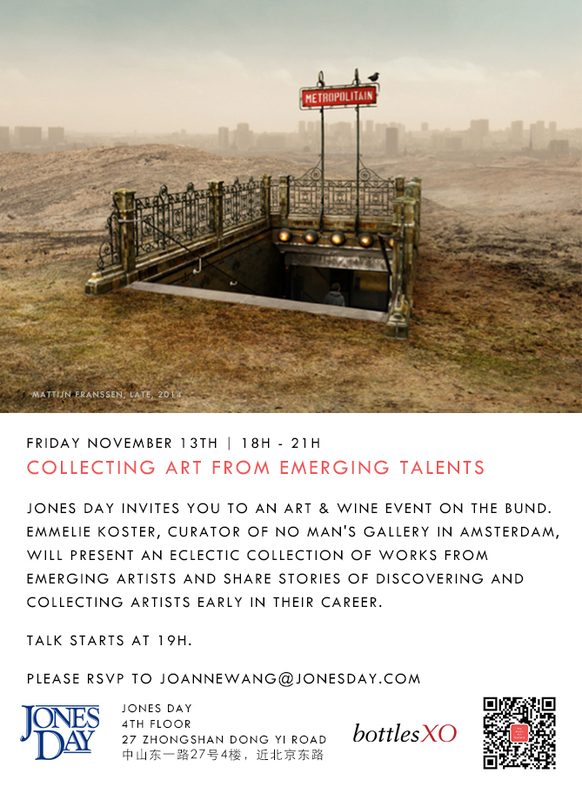 During this talk, Emmelie will share stories of young art collectors and advise on how to start collecting emerging artists. There are only a few spots left for this talk, to attend, please rsvp to joannewang@jonesday.com. If you’d like to know more about our future talks, or want us to give an Art Talk at your company event, please contact Lih-Lan Wong lihlanwong@nomansart.com.